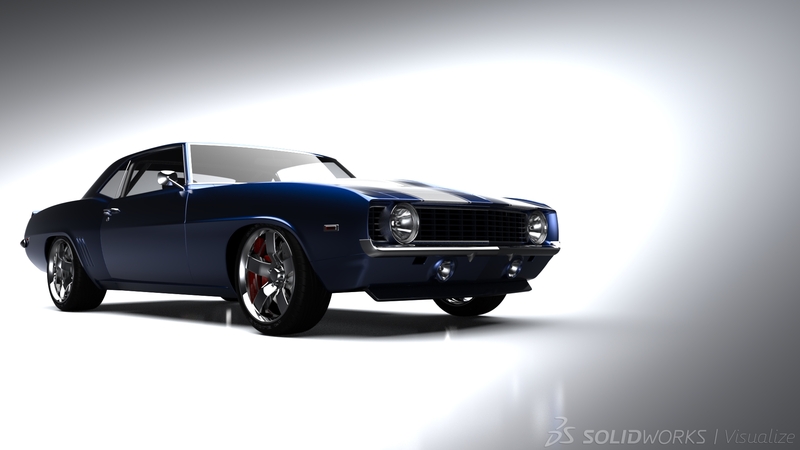 SOLIDWORKS Visualize (formerly known as Bunkspeed) provides a suite of standalone software tools that combine industry-leading rendering capabilities with visual design-oriented features and workflows that enable easy and fast creation of visual content that communicates a design’s vision, passion, and emotion. 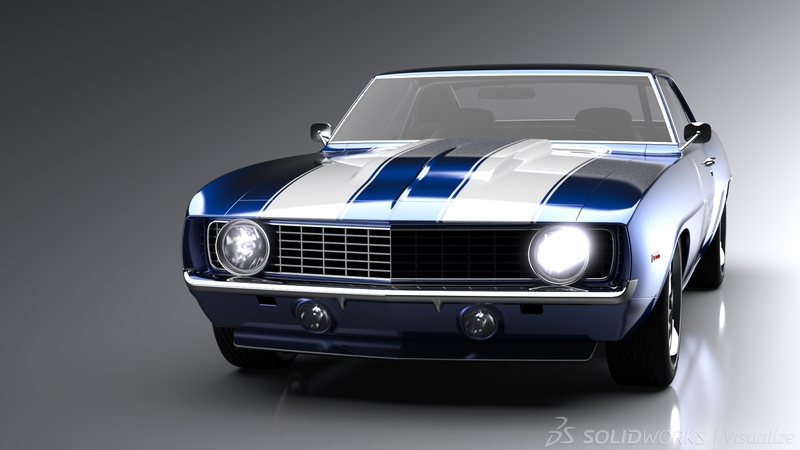 Who can benefit from SOLIDWORKS® Visualization products? Check this link SOLIDWORKS Visualize. This test is dedicated to people who want to work in SOLIDWORKS Visualize and which considering the purchase workstation or mobile workstation to maximize performance. SOLIDWORKS Visualize use technology NVIDIA Iray 2015 with architecture NVIDIA Fermi – Maxwell GPU. Iray progressively refines its image until completion, providing consistent results from interactive editing to final frame. It’s a highly predictive approach that marries with the scalable, world-class performance across NVIDIA GPUs to give constant feedback and rapid results. This slashes the time needed to perfect scenes and deliver images rivaling photographs. What gives you NVIDIA Iray in SOLIDWORKS Visualize? For the tests we used the car model Camaro. We create three cameras: Photo, Route, Bloom. For the testes we used three different hardware as below. All graphics card we use for the tests, shown in the below. See how many CUDA cores we have! 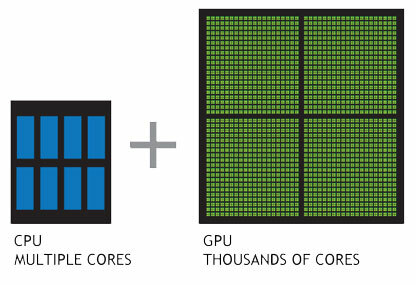 CUDA is NVIDIA’s parallel computing architecture that enables dramatic increases in computing performance by harnessing the power of the GPU (graphics processing unit). Computing is evolving from “central processing” on the CPU to “co-processing” on the CPU and GPU. 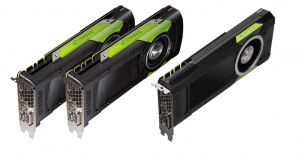 To enable this new computing paradigm, NVIDIA invented the CUDA parallel computing architecture that is now shipping in GeForce, ION Quadro, and Tesla GPUs, representing a significant installed base for application developers. SOLIDWORKS Visualize has the ability to render by using the GPU, what exactly is this different from the normal transfer calculations on the CPU? Check out the video clip below for an entertaining CPU versus GPU. After preparing the model, materials and scenes for all the tested graphics cards we have received the same photo, but with different time. All graphs are presented in unit time (s). At the beginning we decided to see how they handle 2 x Intel Xeon E5-2680v3 / 2.5 GHz. Time for the CPU is between 14-16 min. In the camera Route we see a lot of scenes, so the processor performs les computation. The first one has been inserted into the workstation HP Z840 two cards M6000. SOLIDWORKS Visualize does not require connection cards in SLI technology. We checked it and the difference was very small – around 2 seconds. 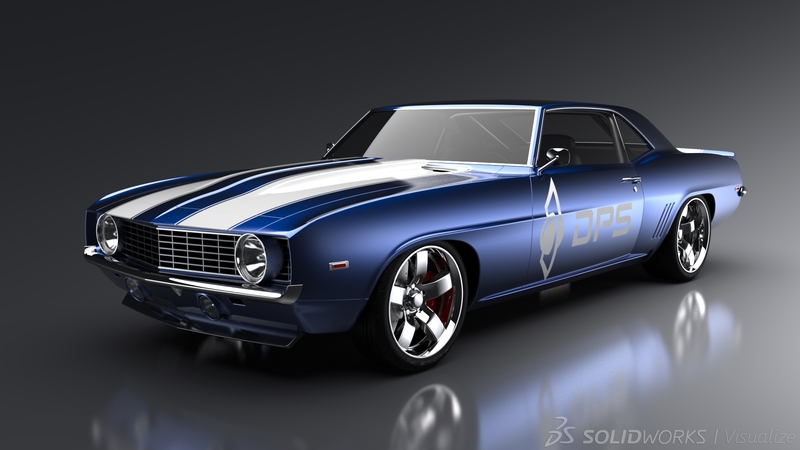 The results show the rendering by using GPU and hybrid options. From the graph you can see that using the same GPU takes approx. 3 min. . It is actually quickly especially that with this option, we have free the processor and can safely work on our workstation because all calculations are done in two graphics cards – total 6 144 cores CUDA! And if we add the 2 processors we are able to shorten the time to 2 min. 43s. You can see the differences rendering depending on the camera settings. 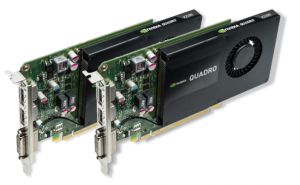 Another test is to use a single card NVIDIA Quadro M6000. We see that time we extended almost doubled. Now we check how they are doing using the same settings the two graphics cards NVIDIA Quadro M5000. Compared to the previous test, we should see a larger difference between the option hybrid and the GPU. Using two cards NVIDIA Quadro M5000 time that we get for the camera Photo and Route is 4 min. 37 s. on GPU and 3 min. 43 s. on Hybrid. One card gets time 9 min. 6s. on GPU, and 6 min. 2 s. on Hybrid. We can observe the role at the hybrid option plays the same processor using a single card we increase almost 3 minutes.! 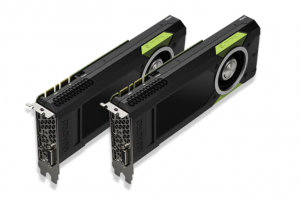 Next graphics card that we use is NVIDIA Quadro M4000. Time for the GPU at 2x NVIDIA Quadro M4000 is 6 min. 40s., Hybrid 4 min. 53 s.
For one card we already have a big jump, because for one card GPUs time we get within 13 min. 18s. Along with processors that time may be close and is 7 min. 32s. You can see a very big difference in options Hybrid, where we get time for one card about 14 min. faster than the GPU. 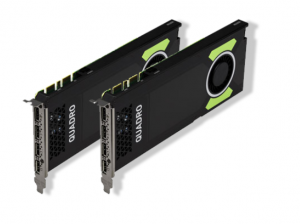 Another card will be NVIDIA Quadro K3100M. 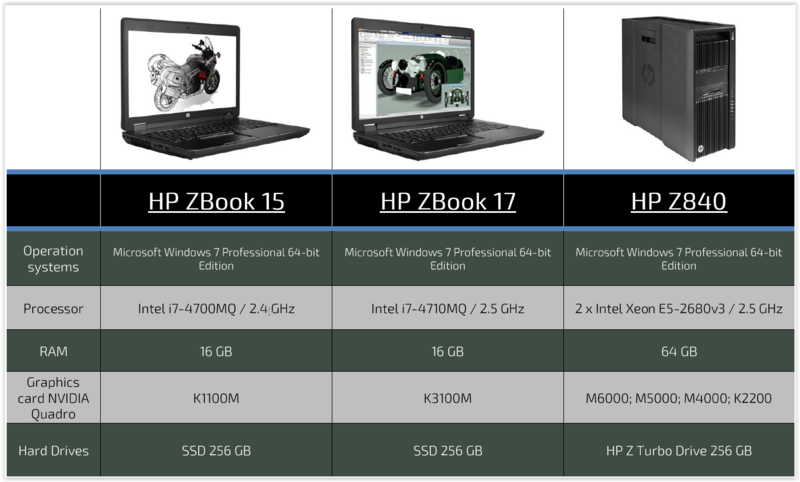 It is used in mobile workstations in the series HP ZBook 17. The time that we get to „Photo” is 36 min. 48s on GPU, while at the option Hybrid 28 min. 19s. NVIDIA Quadro K1100M doing bad, and time we get with it on GPU – 1h 15 min. 36s, Hybrid 46 min. 52s. In addition, this is the minimum graphics card that is required to work with software SOLIDWORKS Visualize. We checked it on the card K610M and even with hybrid rendering option did’t start. The reason for this is too small memory card. With this combination we gain increase about 20 seconds, but as you can see us disappear very difference between GPUs and Hybrid option. 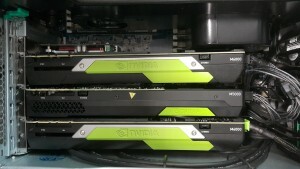 On the top configuration 2x NVIDIA Quadro M6000 we made animation. On the charts, which are presented below is a list of cards that have been inserted into the workstation HP Z840. The last table presents the summary list of all the test graphics cards. You can see that a better option as compared to the prices is used two cards rather than on card with a higher specifications, but we lose an additional PCI slot. Also we need to check the power supply in our workstation is suitable to serve two cards. Using the two processors Intel Xeon E5-2680v3 / 2.5 GHz we get longer time by approx. 2 minutes. than using two cards NVIDIA Quadro K2200. We can assume that one such processor will be comparable to one card. If you have any question please comment! Lukasz has been using SOLIDWORKS for over 8+ years. In the DPS Software is the Senior Technical Specialist CAD/IT/Trainer. Lukas has been award the coveted Elite Applications Engineer in 2014.